Tengrade sought to create a new paradigm rather than wait for other social media platforms to create a “hate” or a “love” button — a frustration shared by many. Tengrade allows you to place an exact number from 0 to 10 on how you feel about any subject. Finally! a way to show dislike, even hatred. In addition, users can see how others inside and outside their peer group rated the same item. MSLK worked with Tengrade to develop the brand identity as well as user experience online and social plug-ins. Our objective was to help users visualize data, creating the Tengrade “Tornado,” a visualization of how inherently positive or negative someone might be when viewing their cumulative ratings. Tengrade is a new social network that allows you to rate, on a scale of 0-10, an endless variety of user-generated topics: politics, sports, movies, and beyond. This goes far beyond Facebook's "like" button, allowing you to express varying degrees between love and hate. Tengrade came to MSLK needing a new identity. Although Tengrade originally came to MSLK for an identity, we uncovered a greater need that would drive the rest of the project: The ratings on people's profiles are the most important part of the web experience and would need to be visualized in a dynamic way. This would not only allow for maximum viewer engagement, but also would make the data clearer and be a real-time snapshot of a user's personality. We started by crafting a simple, yet bold, identity using a gradation from red (love) to black (hate). 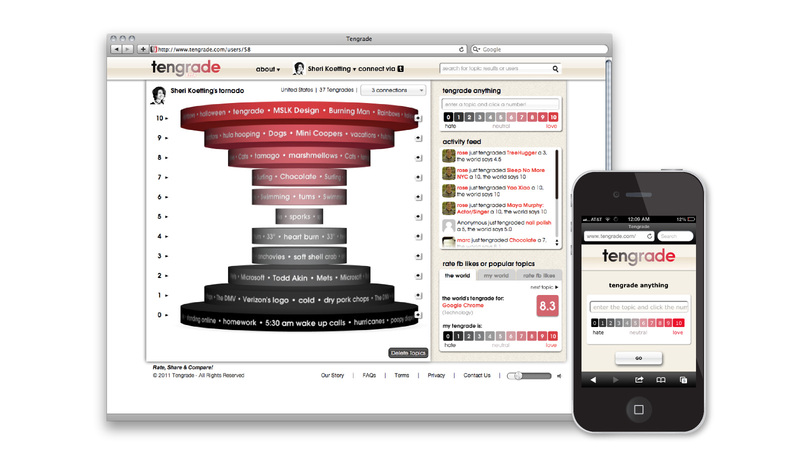 Then we developed the proprietary Tengrade "tornado" — an interactive data visualization of a user's ratings. The tornado is comprised of spinning discs, each representing a level in the Tengrade scale. Its unique format is as clear as it is memorable and engaging. Users can interact with the Tornado to spin each disc and pause it to find out more information about each Tengrade. The shape of the tornado also gives an instant snapshot of a user's personality: positive people are top heavy; negative people are bottom heavy, and indifferent people are barrel-shaped. From a news and market-research perspective, Tengrade's applications are endless. Still in beta testing, Tengrade's true potential has yet to be realized.